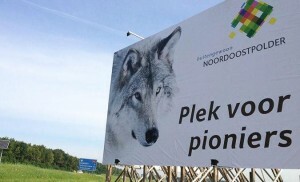 “Noordoostpolder, a place for pioneers!” says this billboard with a big photo of a wolf, along the highway in Noordoostpolder, municipality in the Flevoland Province (Central Netherlands). Several days ago a wolf has been found on a roadside in Luttelgeest, Noordoostpolder. Unfortunately, dead. But even then, this is a great news. 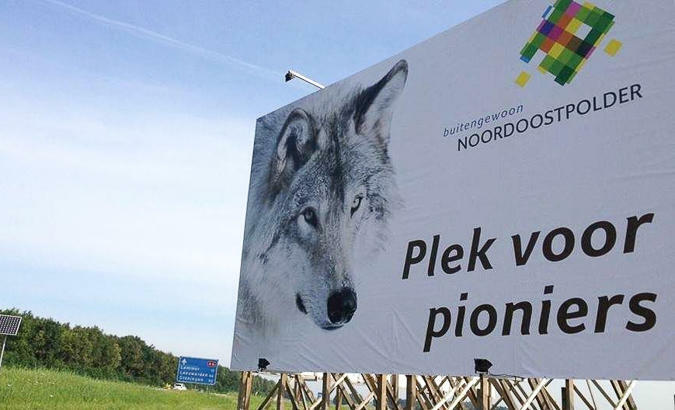 This is a wolf the first time in 150 years the Netherlands! From the very beginning experts are convinced it’s a wolf. On Sunday, DNA checks at Natural history museum Naturalis in Leiden confirmed it. The wolf is back to the Netherlands. Great rewilding news! The final confirmation is expected at the end the week: DNA testing in German Senckenberg Institute. The municipality of Noordoostpolder, a polder which was only reclaimed in 1942, is creative enough to promote the region as a pioneering one. Using this first wolf as a strong symbol to attract tourists, new people and businesses. According to researchers, the Dutch wolf has very likely come from a German pack and may have been on the hunt for a location to start a new pack. Last year there were already observations of a wolf close to the German-Dutch border. The distance from the border to the Noordoostpolder – about 80 km – can easily be covered by a wolf at night. The last confirmed sighting of a real wolf in the Netherlands was in 1869. It happened in Schinveld, Limburg Province (Southern Netherlands). In 2011, two wolves have been reported – in Gelderland near Duiven and in the Veluwe National Park. But the photo’s made back then didn’t give 100% evidence.